Left to right: Wendy Rogers, Chairman Robert Graham, Diane Douglas, Utah Senator Mike Lee, Marina DeWit, Jeff DeWit, Nancy Salmon, Congressman Matt Salmon, and Gabby Saucedo Mercer. 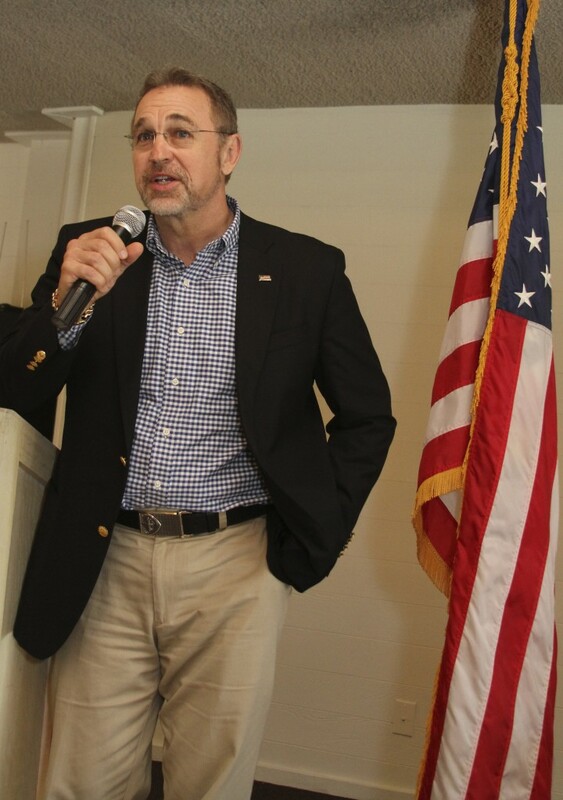 Being very active with the Republican Party in Chandler, Arizona, I have gone to many political events lately. I’m about to sound like a major name dropper! But I want to put a plug in for the people pictured in this post that are up for election. What a nice and fun-to-be-around bunch of people! And they really are trying to get into office or be re-elected to serve the people. The photo above comes with a fun little story. Senator Mike Lee of Utah was the keynote speaker at an Arizona Republican event in September. Photographer Timon Harper had two lighting umbrellas set up so attendees could get a beautiful picture of themselves standing with the Senator. During a lull in the procession, I struck up a conversation with Timon about his camera equipment. 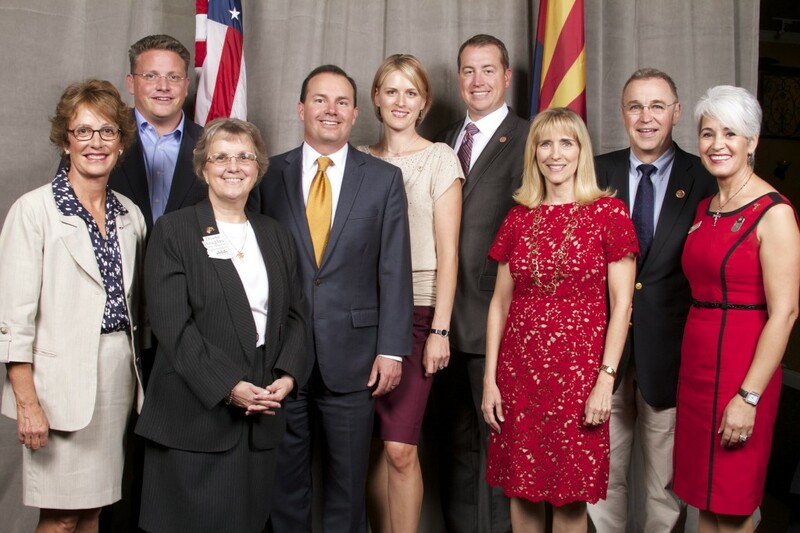 Then I had the thought that we ought to get a photo of some Arizona candidates with Senator Lee while he was here! I mentioned that to a couple of people, and they spread the word. Not only did Timon very graciously let me take a picture of them in front of his lovely backdrop with the flags, he offered to plug my camera into his lighting equipment! Enough about photography for now. Let’s get back to these hard-working candidates! I’ve seen Retired Lt. Colonel Wendy Rogers on her bicycle, riding around her congressional district to personally meet as many people as possible and share her message of restoring America to the principles upon which it was founded. She is running for U.S. Congress. Wendy served in the Air Force as one of its first female pilots. And though she is now a grandma, I’ve seen her drop and do several perfect push-ups–on her toes! I can still only do them on my knees. She is as warm and friendly as she is energetic. 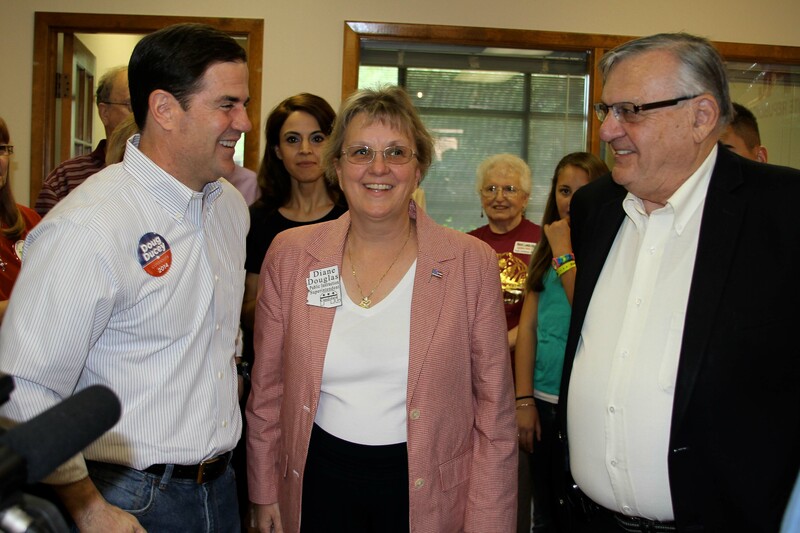 Doug Ducey, Diane Douglas, and Sheriff Joe Arpaio. 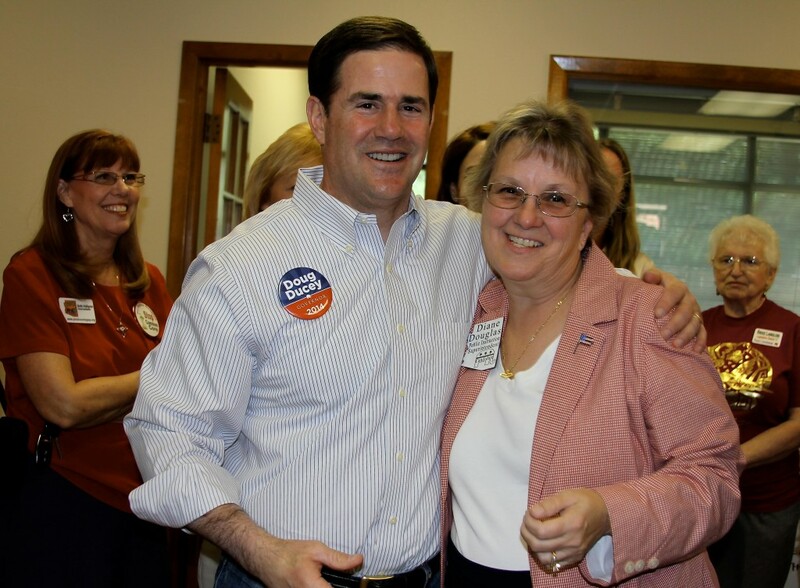 Doug Ducey with Diane Douglas. Another sweet woman I’m supporting is Diane Douglas, who is running for Superintendent of Public Instruction. She is a former school board president and has a B.S. in Business Administration. She is for school choice and parental rights. 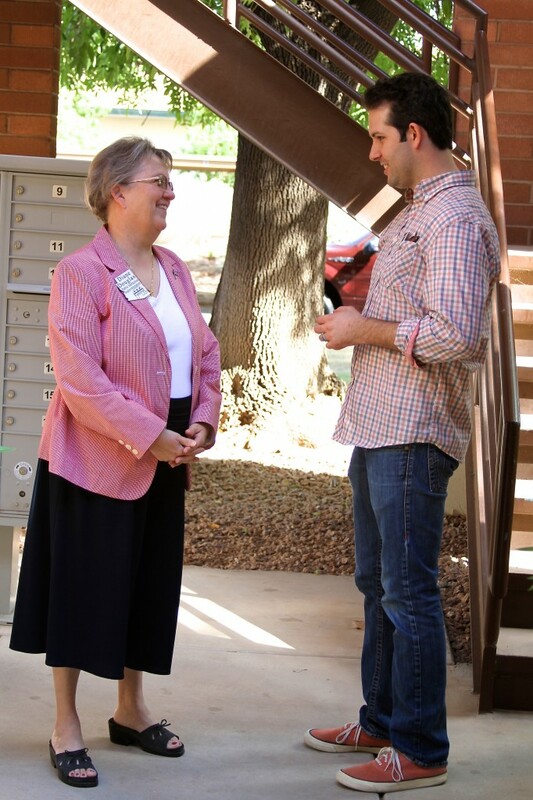 Diane Douglas chatting with Legislative District 17 Chairman Tyler Bowyer. * Rather than reading great literature with examples of beautiful language and good moral values, students are given tons of worksheets with informational and often boring text. * Instead of reading original documents, students rely on other people’s biased writings about those documents. * Teachers are not allowed to teach math with traditional methods. (They hope parents will teach them though!) They don’t even give students enough practice to master specific skills with the other methods taught. * Many students, parents, and teachers I talk to are incredibly confused and frustrated much of the time now with school because of it. 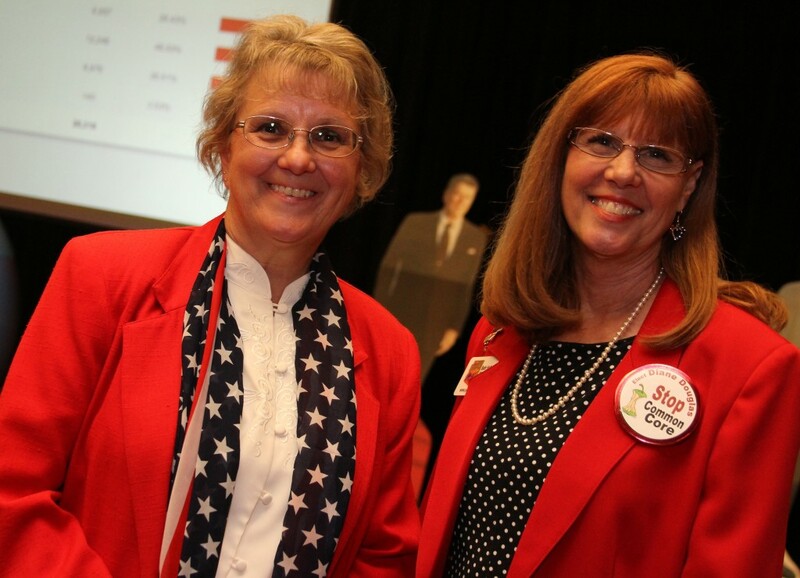 Diane Douglas with Beth Hallgren, who was her Chief of Staff for the Primary Election. Common Core methods work for some individuals. They should get to use them! The rest of us shouldn’t have to! Doug Ducey talks to Republican Party volunteers on November 1st. Here’s someone else I really hope will win the election! 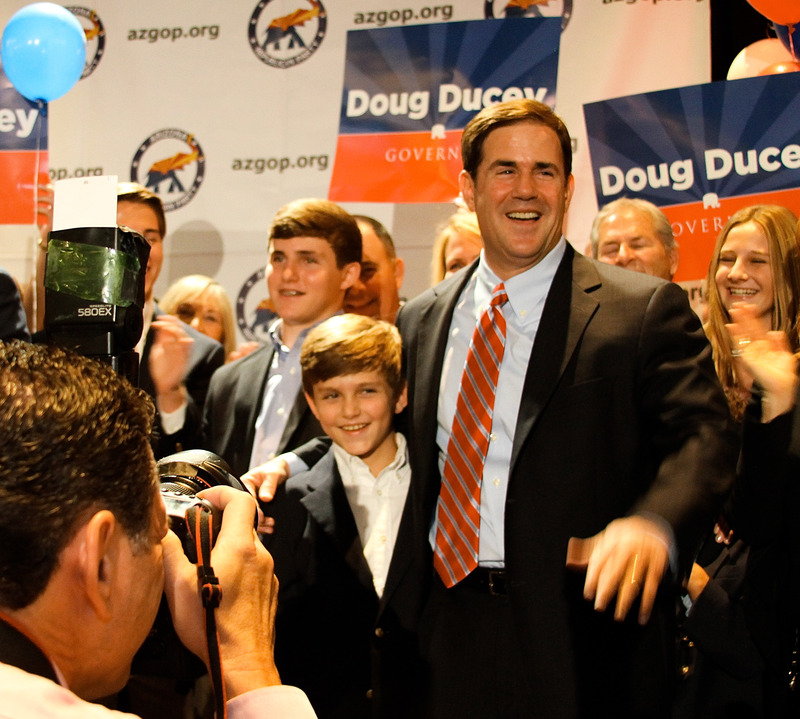 Doug Ducey, his family, and supporters at the Primary victory celebration in August. 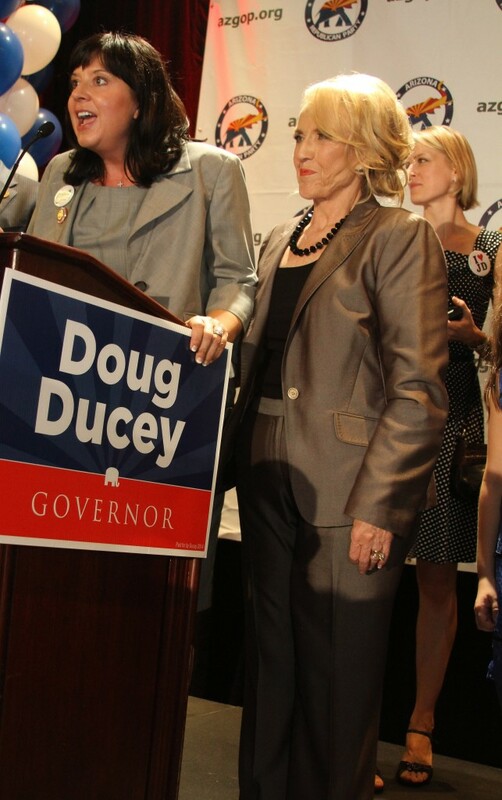 Doug Ducey with one of his sons. You can also see David Kadlubowski of The Arizona Republic newspaper taking a picture. He’s another photographer that’s nice to talk to at events. Individuals of the same political party will obviously have different opinions about some things. But I love it when no matter who people were supporting in the Primary, they come together to rally around those that were elected to represent the party. Even families have disagreements, but we should still stick together! 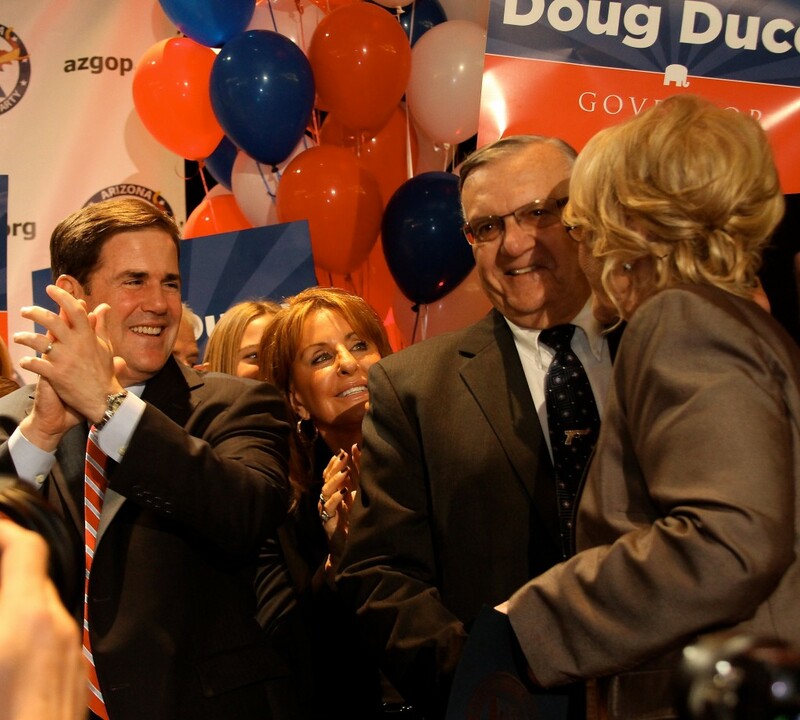 Doug Ducey, Sheriff Joe Arpaio, and Governor Jan Brewer. Sheriff Joe Arpaio can be tough. But he’s also fun to talk to! He’s not on the ballot at this time, so he could stay home and relax. At age 82, who would blame him? 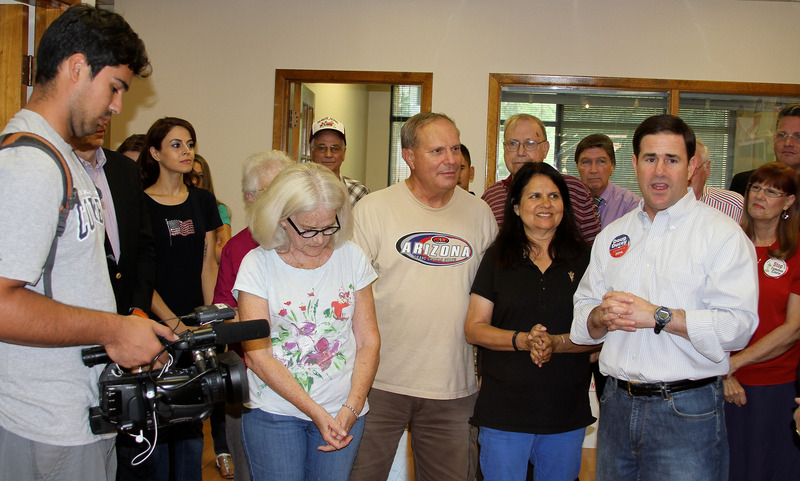 Instead, he keeps on working hard at his job and helping fellow Republicans get elected. He’s proud of his age, and I say he should be. We would all be wise to value those with much experience and wisdom. Sheriff Joe hands Dr. Shadow Asgari his driver’s license so she can figure out how old he is. Congressman Matt Salmon, Shadow, and Sheriff Joe. Dr. Shadow Asgari is currently the 4th Vice Chair in charge of fundraising for my legislative district (LD 17). 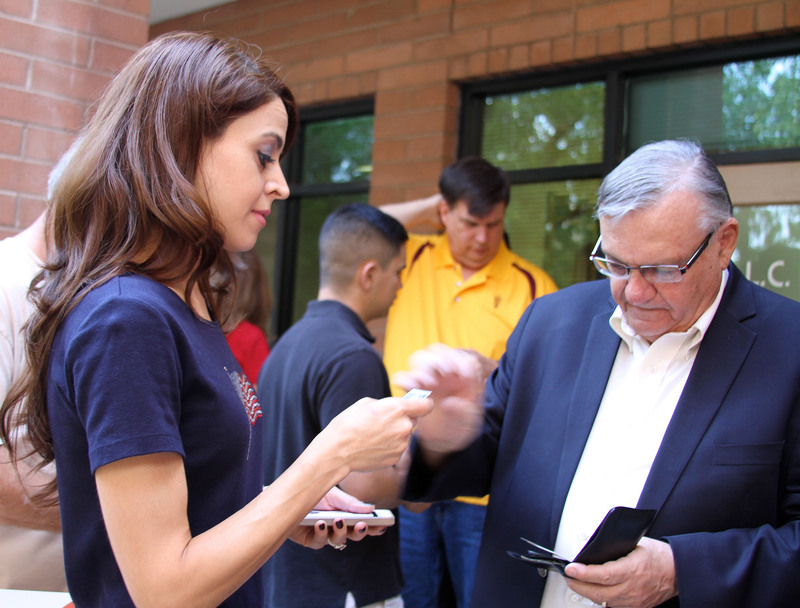 She converses with Congressman Matt Salmon and Sheriff Joe in the photo above. The Congressman had just flown back to Arizona that morning (November 1st) after being very instrumental in the release of Marine Sgt. Andrew Tahmooressi from jail in Mexico. Thank you, Congressman! Matt Salmon is another person who works hard for the people he serves. He spends a lot of time talking to and listening to his constituents. He reminds us of how wonderful it is to live in a free country and how important it is to do what we can to keep it free. Jeff DeWit and his wife Marina enliven a room with their shared sense of humor. Jeff DeWit with his wife Marina, caught in a serious-looking moment. 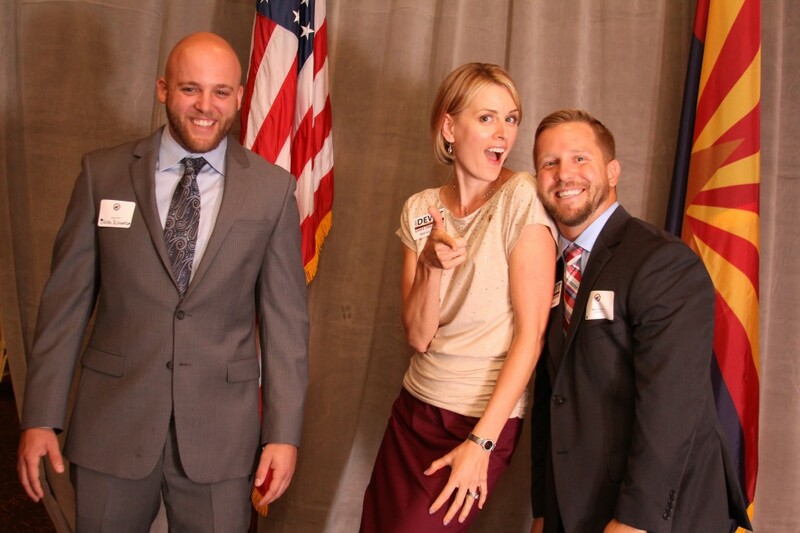 Marina DeWit and two of her husband Jeff’s campaign aids have fun in front of the camera. Jeff DeWit is running unopposed for State Treasurer. 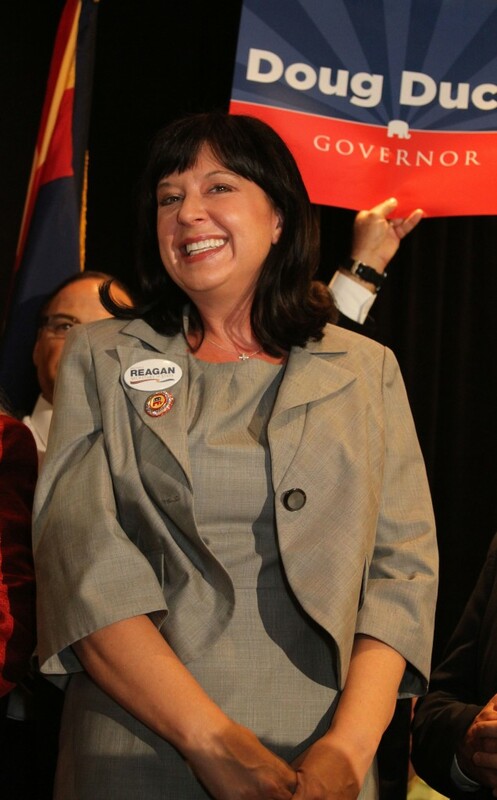 A favorite joke these days is that even Democrats in Arizona will only trust a Republican with their money. And in fact, we’ve had Republicans for Treasurer for many years. 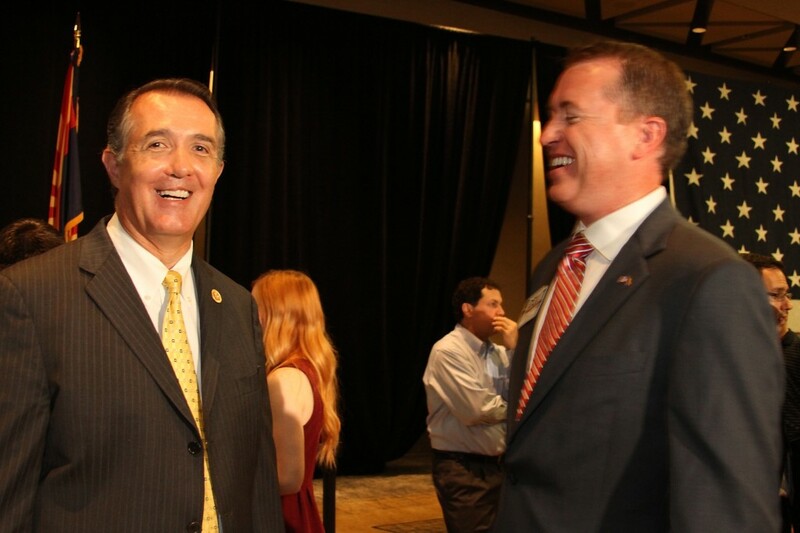 Next, here is Jeff laughing with Congressman Trent Franks. U.S. 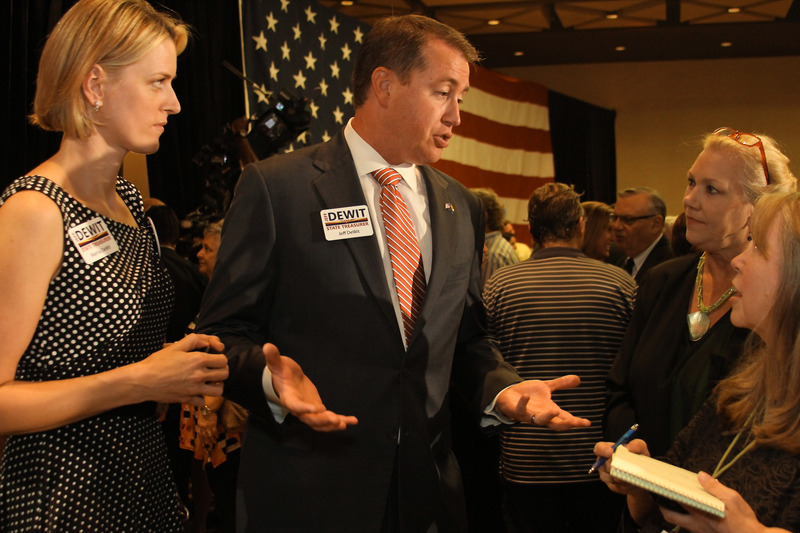 Congressman Trent Franks and Jeff DeWit. 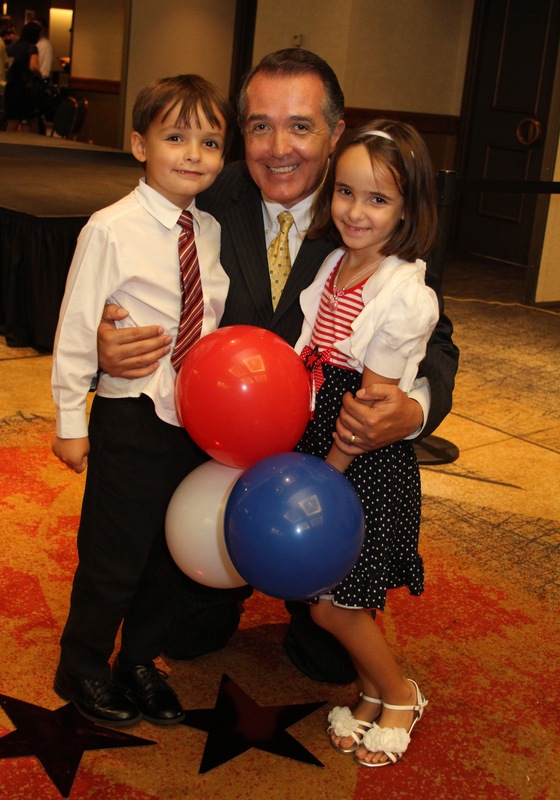 I have to add this photo of the Congressman and his adorable children that were with him at the Primary victory celebration. He said I could! Congressman Trent Franks and his children. 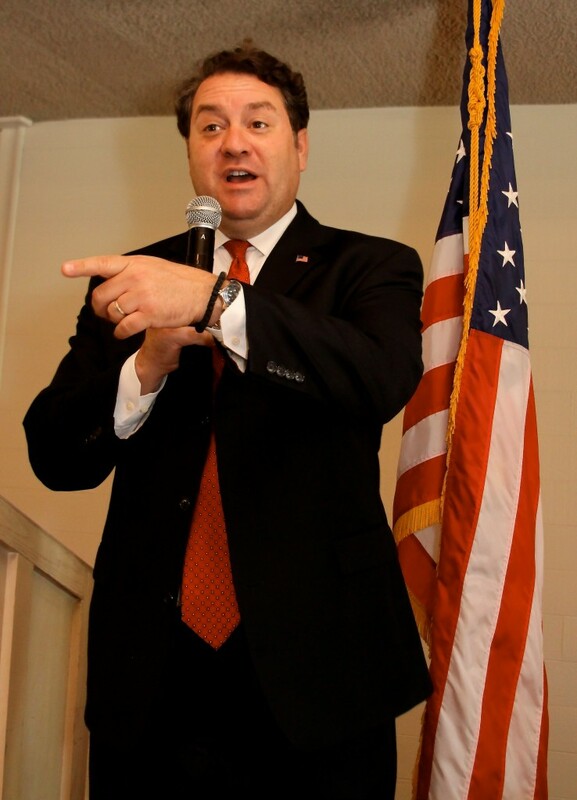 Mark Brnovich talks about the loving support of his family, seen with him. It might surprise you that someone running for State Attorney General would be such a warm, funny guy. But that’s the impression I get every time I’m around Mark Brnovich. Another important vote is for Secretary of State. I recommend Michele Reagan for the job. Michele Reagan, Governor Jan Brewer, and Marina DeWit. And finally, here are some very nice people running for State Representatives! 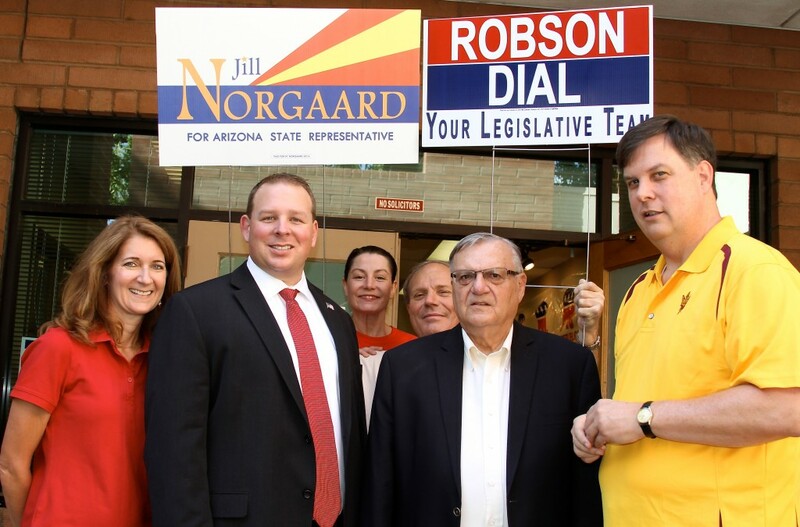 Jill Norgaard, Jeff Dial, Sheriff Joe, and Bob Robson, with stalwart supporters holding signs behind them. I think it’s funny that you can see the No Solicitors sign just underneath the campaign signs. 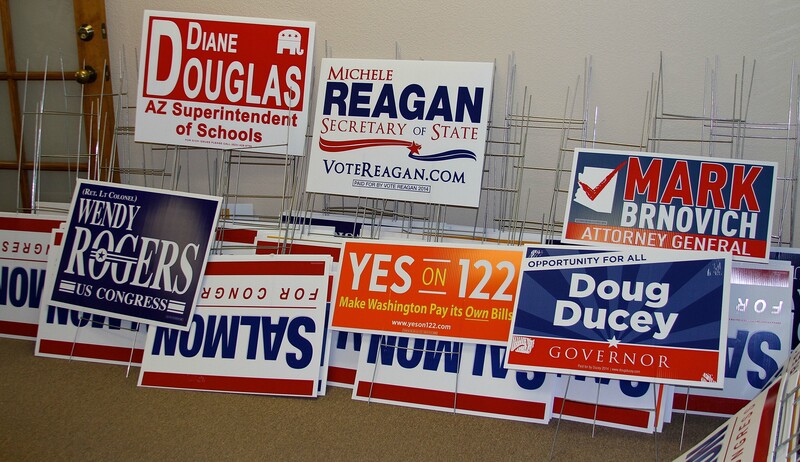 Campaign signs at the local Republican Victory Office. If you think it isn’t worth going out to vote, please know that great effort is taken to make sure every vote is counted correctly…at least in my county. I saw that personally this morning when I observed the early ballot counting at the Maricopa County Elections Office in Phoenix. Today alone, 126,933 early ballots were counted. If a machine spits out a ballot for any reason, human eyes (both Democrat and Republican) look at it to figure out the intent of the voter if they possibly can. Have a happy election day! You’ll feel better if you vote.